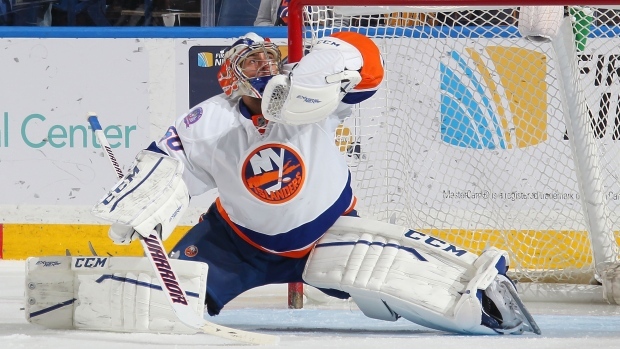 NEW YORK, N.Y. - The New York Islanders have signed goalie Kevin Poulin to a one-year, two-way contract. The Islanders announced the deal Tuesday. Financial terms of the deal weren't disclosed. Poulin had a 2.87 goals-against average with a .912 save percentage in 45 games for Bridgeport last season in the American Hockey League. The Montreal native has played 50 career NHL regular-season games, going 18-25-3 with a 3.07 GAA. The 25-year-old Poulin has appeared in 156 career AHL games, all with the Sound Tigers, since making his professional debut in 2010-11. Poulin spent four seasons with the junior Victoriaville Tigres.